Your student athlete’s season is winding down. There is a light on the horizon. A beacon that promises normal dinners around the table instead of too many carbs stuffed in faces before, during, or after practices and games. You may, perchance, sit of an evening with a book, or peruse the on-demand list of TV shows you’ve missed on game nights. Maybe you’ll explore this thing called Pinterest that is probably on the wane by now. Then the hammer drops in the form of a sheet of paper produced by Team Mom. Football Banquet it says in cheery letters. A typical sports banquet pot luck buffet. Before all of you gung-ho Team Moms join forces to hunt me down and stone me as a sports-parent heretic, please realize that I was you. 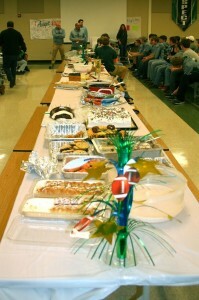 I’ve been behind the pot luck, ice cream social, spaghetti buffet, what-will-it-be-this-year whirl. I was a Team Mom, and I was on the board, and I helped organize dinners, and I ordered trophies, and I did all that crap. I’m no longer leading the charge but I do my parental duty in 50/50 ticket sales and concession stand shifts. Heck, this week I helped decorate our local American Legion with green tablecloths and streamers so guys who can bench press more than my car weighs feel the love. “It’s for the kids,” the better, more devoted moms say in hushed tones. In my childish tantrum, I am thinking that the twenty games I’ve been to were for the kids. Thousands of miles driven for preseason conditioning that started in January and the four or five practices a week that started in July were for the kids and…I want a vacation. I want tonight off. I’m sure the coaches want tonight off, too. Admit it, the players are just going to huddle around the teenager tables and play finger football with the confetti. They’d rather the girls soccer team be invited instead of their own parents. They’ll guffaw at private jokes between them and their coaches that they won’t explain on the car ride home. And the coaches will talk about every player. Every blessed one. And the Team Mom will talk about every volunteer. Every blessed one. Not really. Because I’ll see my son recognized, along with all the friends he’s been playing this sport with for years. They’ve all worked hard and they deserve this closing moment of glory. I’ll have a chance to chat with some of the other long-suffering parents who I’ve cheered next to for the last ten weeks. Plus, I know if I can get through this banquet, the light on the horizon will be here. Rest and relaxation await, just 24 hours from now. My evenings will be mine for what I want to do. I’ll be free to…to…oh, dangit, the holidays are only two weeks away. Am I A Bad Football Mom? There’s No Empathy In Football?! ?